4015 1615 Laser Hot Hits. Tony James show. Dollar "Give Me Some Kind of Magic", then Van Morrison song. SINPO 44433. 6208 1830 Unid. The Cure "A Forest", then Blur song. Strong signal but some utility splash. Maybe Armadillo. SINPO 54444. 6240 0900 Radio Focus International. "Shout to the Top", ID jingle, Prince "Purple Rain." Fair-good signal. SINPO 34333. 6300 1555 Radio Tower. Instrumental music, ID and giving out email address. Good signal. SINPO 44433. 6305 0845 Radio Altrex. IDs and chat, oldies. Weak-fair signal. SINPO 24332. 6305 1640 Radio Osaka. "Mexican Girl," weak-fair signal. SINPO 24332. 6420 1707 Radio Tidalwave. ID and greetings, giving out email address, "Big In Japan." Strong but fady. SINPO 54433. 6510 0908 Radio Rising Sun. Murray Head "One Night in Bangkok", weak-fair signal. SINPO 24332. 6930 0913 Irish Music Radio. ID, then Elton John "Crocodile Rock." SINPO 34333. 6980 0918 Laser Hot Hits. The Police "Don't Stand So Close To Me." SINPO 34333. 3905 2219 Skyline International Radio. ID and greetings, Michael Jackson "Beat It." SINPO 44433. 3930 2225 Polaris Radio. ID, greetings, mention this blog (thanks), music by Dutch group. Fair-good signal. SINPO 34333. 4015 1750 Laser Hot Hits. Belinda Carlisle "Circle in the Sand," SINPO 44433. 6240 1738 Rado Focus Int. New station on the air, "Knock on Wood", then "Shout to the Top," ID jingle and giving out email address: focus (@) live.co.uk. Good signal. SINPO 44433. 6300 1733 Radio Paardenkracht. ID, QSO with Radio Rob. SINPO 34333. 6930 1744 Irish Music Radio. ID and links between records, "Sugar Candy Kisses." SINPO 34333. 6980 1747 Laser Hot Hits. Jonah Lewie "You'll Always Find Me in the Kitchen at Parties," SINPO 44433. 4015 1840 Laser Hot Hits. Genesis song. Fair signal. SINPO 34333. 6300 1755 Unid. Flash & The Pan "Waiting for a Train." No ID heard, strong. SINPO 54444. 6325 1800 Unid. Blackbyrds "Walking in Rhythm," fair. SINPO 34333. 6375 1835 Radio Tina. ID, Abba "Dancing Queen" fair. SINPO 34333. 6980 1840 Laser Hot Hits. Diana Ross "My Old Piano." Fair signal. SINPO 34333. 4015 1925 Laser Hot Hits. Altered Images from the 80s with "Don't Talk to Me About Love." SINPO 34333. 6305 1725 Radio Tarzan. Paul Young "Love of the Common People," good signal. SINPO 44433. Still going strong at 1930. 6980 1735 Laser Hot Hits. Another frequency change. Paul Stuart programme. Talking about there being no beer, playing Gary Numan and George McRae songs. SINPO 34333. 4015 0835 Laser Hot Hits. Martin Scott programme. Cathy Dennis "Fallen," fair signal. SINPO 34333. 5820 0815 Orion Radio with Radio Tina. Dutch music, good signal. SINPO 44444. 6045 0935 Iceman Radio via Wertachtal. ID jingle, rock n roll. Strong. SINPO 54444. 6095 0925 KBC via Wertachtal. America "Ventura Highway," strong. SINPO 54444. 6140 0905 Radio Gloria via Wertachtal. The Verve song, then Johnny Depp song. Strong. SINPO 54444. 6215 0820 Radio King Shortwave (tent). "More than A Woman to Me," modulation seems to be getting worse. SINPO 34332. 6375 1835 Radio Caroline Int. ID jingles, pop/dance music. SINPO 34333. 6420 0930 Radio Tidalwave. Dutch music, utility QRM from 6425. SINPO 43433. 6930 0825 Irish Music Radio. ID, then The Who "My Generation." SINPO 44433. 6985 0830 Laser Hot Hits. Adele song, it seems the station moved to avoid Galei Zahal which has returned to 6973. SINPO 44433. 7630 0950 Free Radio Victoria. Rod Stewart "Maggie May," ID, then Manfred Mann "Blinded By the Light." SINPO 44433. 9480 1007 European Music Radio via MV Baltic Radio. Black Sabbath "Paranoid," weak-fair signal. SINPO 24332. Andy Burnham (ex of Radiofax) writes: “We are approaching the 20th anniversary of the closedown of the shortwave station Radiofax later this year and I have taken on the task of uploading archive programmes from my weekly technical programme Sparks and others, from the early programmes, going right up until the closedown in September 1992. “I am finding some fascinating stuff in these programmes, the period of the early 1990s when digital technologies were just starting to take off, but before the Internet took hold is often overlooked so I’m hoping to redress the balance a little. Andy Sennitt of Media Network adds: The URL is www.radiofax.org and I have added it to the list of links on the right of this page. Radiofax was featured a number of times on Media Network, and of course the team included the late Bob Tomalksi, who was a friend of the programme and sadly passed away in 2001. I often wonder what Bob would have made of all the changes that have taken place in international broadcasting in the first decade of this century. Radiofax was an unlicensed station that believed in producing quality programming rather than just playing records. Programmes included science, technology and media news.Co-founders Andy Burnham and Trevor Brook fought a valiant campaign to get a licence to broadcast on shortwave. The case even reached the International Court of Human Rights. This was one of the final items posted to the Media Network weblog which closed yesterday. I for one will be sorry to see it go. It was a great source for news from the world of shortwave and radio in general. 3905 1700 Radio Spaceman. 10CC "I'm Not In Love," good signal. SINPO 44433. By 1900 very good - 54444. 4015 0850 Laser Hot Hits. Country rock, weak-fair signal. SINPO 24332. 4026 1827 Unid. Toto "Hold the Line", non-stop oldies, earlier were offshore recordings. Strong signal. SINPO 54444. 6095 0925 KBC via Wertachtal. Emperor Rosko with country music. SINPO 44433. 6300 1710 Radio Witte Reus. Signing off, off at 1712. SINPO 34333. 6300 1750 Radio Tarzan. Dutch music ID, splatter from what is possibly's Cairo's transmitter putting out S9+40db noise on 6283. SINPO 43433. Moved to 6305 at 1753 - SINPO 44433. 6315 0948 Radio Altrex. Weak signal heard through the noise. SINPO 24332. 6325 0935 Radio Black Bandit. Greeting Pluto, country music, occasional strong peaks. SINPO 44433. 6375 1853 Radio Caroline Int. ID jingle, pop/dance music, signal good tonight. SINPO 44433. 6420 1805 Radio Tidalwave. IDs and greetings, Robert Plant song, utility splash. SINPO 53443. 6450 1740 Radio Universe. Human League "Don't You Want Me Baby," co-channel QRM. SINPO 53443. 6510 1825 Radio Rising Sun. Oldies, fair-good signal. SINPO 34333. 6930 0840 Irish Music Radio. Rock n roll megamix, Theme from A Team, ID jingle. SINPO 34333. 6985 0830 Laser Hot Hits. Change of frequency, Dave Simpson show. Eagles "What Do I Do With My Heart." SINPO 44433. 7625 1800 Radio Northpole. Oldies, good signal. SINPO 44433. 9305usb 1740 Radio FSM. Greetings, ID, New Order song, then off. Fair signal but clear. SINPO 35443. 3905 2305 Skyline International Radio. Techno version of "Aquarius", ID and greetings. Good signal but bit fady. SINPO 44433. 4015 2315 Laser Hot Hits. Weak signal with some sort of ute noise on lower sideband. SINPO 23332. Thanks to Gary Drew for letting me know about this. 4015 1750 Laser Hot Hits. Moody Blues song, some utility splash. SINPO 43433. 5280 0907 Orion Radio. "It Never Rains in Southern California," promo for summer meeting, ID. Good signal. SINPO 44433. 6005 0900 European Music Radio via Radio 700. Sign on with Tom Taylor, Pink Floyd "Arnold Layne," parallel with 9480. SINPO 44433. 6200 0850 Radio Orang Utan. IDs and oldies, weak-fair reception. SINPO 24332. 6210 1600 Misti Radio. Light music, weak-fair signal. SINPO 24332. 6214 0938 Radio King Shortwave (tent). "Papa Was A Rolling Stone," fair signal but again poor mod. SINPO 34333. 6220 1045 Bogusman. Alternative music, talking about poetry and The Ghoul. SINPO 54444. 6250 1150 Wizard Radio. Weak and noisy signal, heard with talk and music. SINPO 24332. On 6262 at 1200, a bit better - 34333. 6256 1552 Radio Rainbow. ID, greeting Achim, Simple Minds "Don't You Forget About Me." SINPO 34333. 6265 1129 Cupid Radio. ID, dance music, good with strong peaks but some fading. SINPO 44433. 6283 1535 Radio Mi Amigo (UK). Alan Parson Project "Eye in the Sky" and then "You Can Do Magic," talk and IDs. Fair signal. SINPO 34333. Heard on 6288 at 1655 - strong but some ute QRM. SINPO 53443. 6295 1015 Radio Blackbird. Female singer, weak signal. SINPO 24332. 6305 1605 Radio Osaka. Jingle ID, oldies. SINPO 34333. 6306 0855 Radio Countdown. Paul Simon "You Can Call Me Al." SINPO 34333. 6320 0952 Skyline International Radio. Yazz "The Only Way Is Up," ID and greetings. SINPO 34333. 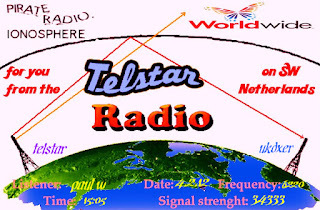 6325 1545 Radio Telstar (NL). ID and email address, song "Tequila." SINPO 24332. 6326 1730 Radio Caroline-Rainbow. Caroline jingle, pop music, weak-fair signal. SINPO 24332. 6330 1110 Radio Zodiac. ID, The Clash "London Calling", fair signal with some utility QRM. SINPO 33333. 6420 1633 Radio Mustang. ID, Fleetwood Mac "You Can Go Your Own Way." SINPO 54444. 6450 0945 Radio Universe. Spencer Davis Group "Keep on Running," then ID, The Cure "Boys Don't Cry." SINPO 34333. 6930 1007 Irish Music Radio. Saying one year old today, Joe Dolan song. SINPO 34333. 6960 1615 Atlantic Radio (pres). Back on the air, dance music, strong signal. SINPO 54444. 6970 1000 Laser Hot Hits. Sad Cafe "Strange Girl," then Talking Heads "Psycho Killer." Strong. SINPO 54444. 7475 1038 Trans Europe Radio. ID, "I Don't Want to Lose Your Love," good signal. SINPO 44433. 7490 1105 Radio Geronimo SW. Faded in now, ELO song, Dave Scott giving contact details, reading emails. Strong now. SINPO 54444. 9480 0902 EMR via MV Baltic Radio. Running parallel with 6005, no as strong. SINPO 34333. The global pirate HF weekend organised by Harri in Finland has been moved from the weekend of March 24-25 to the weekend of March 31-April 1. 4015 1925 Laser Hot Hits. Tony James show. Dire Straits "Tunnel of Love." Strong. SINPO 54444. 6095 1220 KBC via Wertachtal. The Applejacks "Tell Me When," then giving out email and web address. Good signal but some fading. SINPO 44433. 6214 0925 Unid. Jean Michel Jarre music, then rock, possible ID but poor modulation. Maybe King Shortwave. SINPO 34333. 6293 1525 Misti Radio. BZN music, fair signal. SINPO 34333. 6300 1555 Radio Witte Reus. "I Heard it Through the Grapevine," then "Black Betty." SINPO 34333. 6300 1940 Geostar Radio. Lots of IDs, "Walking on Sunshine", fair signal but strong peaks, some splash from 6310. SINPO 33333. 6304 1550 Delta Radio. Testing with 10W, weak-fair signal. SINPO 24332. 6306 1605 Radio Countdown. Boney M then Nirvana. Fair reception. SINPO 34333. 6310 1945 Radio Tarzan. Boney M "Ma Baker" then ID and Madonna "Like A Prayer." SINPO 54444. 6315 1530 Old Timer Radio. Dutch music, good with strong peaks. SINPO 44433. 6325 1935 Radio Underground. Greetings and mention MW test, Dutch music. Fair-good signal. SINPO 34333. 6375 1747 Radio Caroline Int. Pop/dance, jingle IDs. Fair signal. SINPO 34333. 6420 1800 Radio Tidalwave with Radio Mustang. ID, said short test, Bronski Beat "Smalltown Boy," then U2 "In the Name of Love." utility splash. SINPO 53443. 6510 1755 Radio Rising Sun. Eighties music, fair signal. SINPO 34333. 6930 1010 Irish Music Radio. Pussycat "Mississippi", weak with fair peaks. SINPO 24332. 6940 1543 Trans Europe Radio. Peter Henn "Flip Flap", good signal, off few minutes later to test in 19mb. SINPO 44433. Heard on 6920 at 1937 - SINPO 34333. 6970 1000 Laser Hot Hits. Ad for FSN news, The Who "My Generation." SINPO 34333. 3907 1935 Unid. Rock music followed by Dutch song. No ID but strong signal. SINPO 54444. 4015 1945 Laser Hot Hits. "Invitation to Saturday Night," fair. SINPO 34333. 4015 1800 Laser Hot Hits. Karel Fialka "Hey Matthew," good signal but some fading. SINPO 44433. 6212 1715 Radio Sluwe Vos. Pink Floyd, Dutch song, jingle ID. Fair signal. SINPO 34333. 6290 1702 Radio FSM. "Flying Spaghetti Monster" ID, greetings, Editors song, some utility QRM. SINPO 33333. 6425 1700 Misti Radio. "Ha Ha Said the Clown" signing off. SINPO 34333. 6925 1817 Radio Black Arrow. Depeche Mode song, ID at 1830 and greeting listener in Sofia, strong signal. SINPO 54433. 6970 1822 Laser Hot Hits. Dave Simpson signing off, instrumental music, ad for Feature Story News, then Peter Frampton song, strong. SINPO 54444. 4015 2115 Laser Hot Hits. Kerry Ann "Better Than This." then The Corgis "Everybody's Gotta Learn Sometime." Good signal with strong peaks but some fading. SINPO 44433. Laser Goes DX Show 1 - November 2011. Laser Goes DX Show 2 - Xmas 2011. Laser Goes DX Show 3 - Jan / Feb 2012. In internet explorer browsers, right click and 'save target as' to keep the above files. Some of you might have noticed I haven't been posting many logs recently on this blog. I haven't had much time but will try and put stuff up when I get a chance. 3905 1815 Skyline International Radio. ID and greetings, Dutch song, good signal. SINPO 44433. 4015 1808 Laser Hot Hits. Martin Scott show. INXS "Disappear." Good signal. SINPO 44433. 6095 1010 KBC via Wertachtal. Emperor Rosko show. Country music. SINPO 54444. 6326 1823 Radio Caroline Int. IDs, pop music, fair signal with good peaks. SINPO 34333. 6510 1820 Radio Rising Sun. IDs and email address, Bonnie Tyler "It's A Heartache." Fair signal. SINPO 34333. 6930 0950 Irish Music Radio. IDs and rap music. Fair reception. SINPO 34333. 6970 0955 Laser Hot Hits. Song "Hey Matthew," fair signal. SINPO 34333. The latest monthly MW Pirate Review is now ready to download with many recordings of pirate stations heard in the UK during February. Click here http://www.mediafire.com/download.php?e4ntfn99i74utpu to download edition number eight. In addition to our own recordings we have a selection of stations heard by Wire UK in the north-west of England, a recording made in the Netherlands and an archive recording. So, please enjoy the latest review which features over 50 recordings. If you have any comments please email us or leave them here on the AM Forum in Dutch or English. Between 14.52- 21.05 UTC/ 15.52- 22.05 CET a repeat of the complete February 26th broadcast will be streamed via internet: < http://nednl.net:8000/frsh.m3u>. And more good news: next Sunday March 11th 07:52- 14:03 UTC/ 08:52-15:03 CET the broadcast will be repeated on 7600 and hopefully 9300 kHz. "Hello all! Keith's birthday seems an appropriate day to announce here a two-part special looking back at the pirate radio era, being broadcast this Easter on BBC Radio Norfolk. Going out across two episodes at 12 midday on Easter Sunday and 1pm on Easter Monday, "Pirates on Parade" features Keith, Andy Archer and Tom Edwards chatting and swapping stories about their watery wireless days, interspersed with some appropriate pirate-era tracks! I've had the honour and pleasure of editing for broadcast David Clayton's interview session with the trio, and I can promise it's a must-listen for any fan of Keith, Andy or Tom in particular or the pirate days in general! I'm afraid it's only scheduled for Radio Norfolk for now, but it will of course be available online! (And fingers crossed we may even have stopped snap, crackle and popping online by then... I can't promise anything though, out of our hands)." 4015 1005 Laser Hot Hits. Stewart Ross show. Starship "Tell Me You Love Me." SINPO 34333. 6207 1705 Radio Merlin Int. Eagles "Hotel California," ID and greetings, fair signal. SINPO 34333. 6220 1655 Radio Sluwe Vos. Oldies, ID, weak-fair signal. SINPO 24332. 6295 1610 Unid. Laser 558 recordings, Blondie "Sunday Girl." SINPO 44433. 6299 1800 Radio Zeewolf. "Bend Me Shake Me", good signal. SINPO 44433. 6299 1825 Wizard Radio. Asking for QSO, fair signal. SINPO 34333. 6306 1700 Misti Radio. Country music, some splash from unid station on 6310. SINPO 33333. 6325 1630 Radio Zeewolf. Oldies, fair signal. SINPO 34333. 6420 1720 Radio Mustang. ID, The Doors "Light My Fire," strong. SINPO 54444. 6450 1615 Radio Universe. ID, greetings, giving out email address, Jean Michel Jarre music, "Pinacolado" song. SINPO 34333. 6510 1710 Radio Rising Sun. Chris de Burgh "Lady in Red," fair. SINPO 34333. 6920 1620 Trans Europe Radio. "I Won't Step Down", good signal, some fading, ID, greetings and email address, talking about Radio Shadow's operator passing away. SINPO 44433. 6930 0935 Irish Music Radio. Adele song, IDs, fair signal. SINPO 34333. 6960 1820 Atlantic Radio. Blank carrier for much of day but audio now, Roxy Music "More than This." SINPO 54444. 6970 0940 Laser Hot Hits. Paul Stuart show. Odyssey "Inside Out." SINPO 34333. By 1815 up to SINPO 54444.